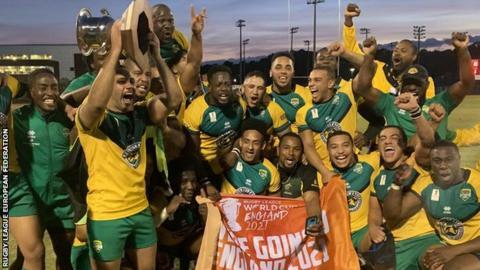 Jamaica qualified for the Rugby League World Cup for the first time after beating the United States in the final of the Americas Championship. A 16-10 victory in Jacksonville sees the Reggae Warriors become the 11th nation to reach the 16-team 2021 World Cup, to be held in England. Both teams scored two tries, but four goals by London Skolars half-back Jy-Mel Coleman proved decisive. "This is massive for our nation," said head coach Romeo Monteith. "To reach a World Cup is something extra special, it feels like there is one love." Leeds full-back Ashton Golding was named man of the match after defying a neck injury to play a key role in Jamaica's victory. The USA, who played in the 2017 World Cup, will have a second chance to qualify via a repechage competition in 2019. "We've made it very hard for ourselves now," said head coach Sean Rutgerson.